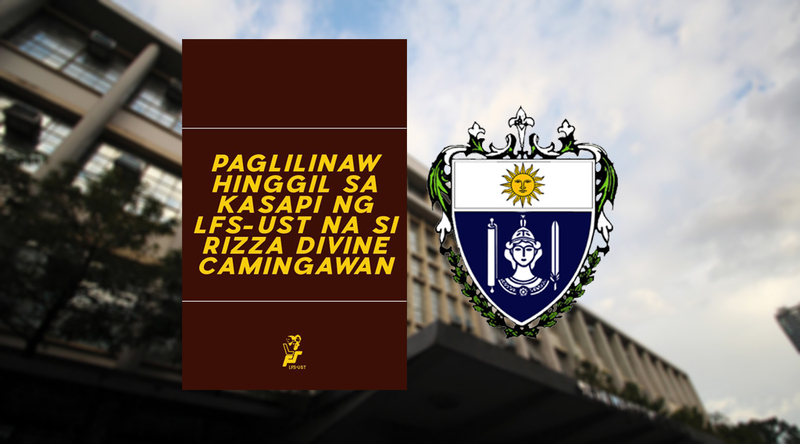 LEGAL MANAGEMENT freshman Rizza Camingawan is not missing, the League of Filipino Students-University of Santo Tomas (LFS-UST) clarified after the news of the LFS member’s alleged disappearance made rounds on social media. In a statement released Thursday on their Facebook page, LFS-UST said Camingawan has contacted her parents and informed them that she is safe in Quezon province where she is taking part in an immersion program with farmers, an activity that LFS offers to its members. On Tuesday, Camingawan’s father, Ronald, announced in a Facebook post that the student was missing and asked for help after their family lost contact with her. The post was later deleted. In an interview with the Flame, Asst. Dean Narcisa Tabirara disclosed that Camingawan’s mother approached the Dean’s Office to find out more about her daughter’s affiliations. “[S]ome time before classes ended, […] I was able to talk to the mother, who inquired, or was simply informed, that her daughter was participating in some activity that had to do with the Lumad,” Tabirara said. “But then, after two days of being at home, she just found a letter stating that her daughter said in that letter that she was going to be away for a longer period of time and that it was not possible for her to have any contact with anybody,” Tabirara added. The assistant dean said she directed Camingawan’s mother to the Simbahayan office for assistance. “I know that Prof. [Froilan] Alipao (Simbahayan assistant director) and the Simbahayan were involved in some activities related to the Lumad. Baka matulungan niya ‘yung nanay para ma-trace siya or at at least get to know the whereabouts of her daughter. So that’s as far as our help consisted of,” she explained. The Faculty administration cannot take any further action on Camingawan’s case, Tabirara added.